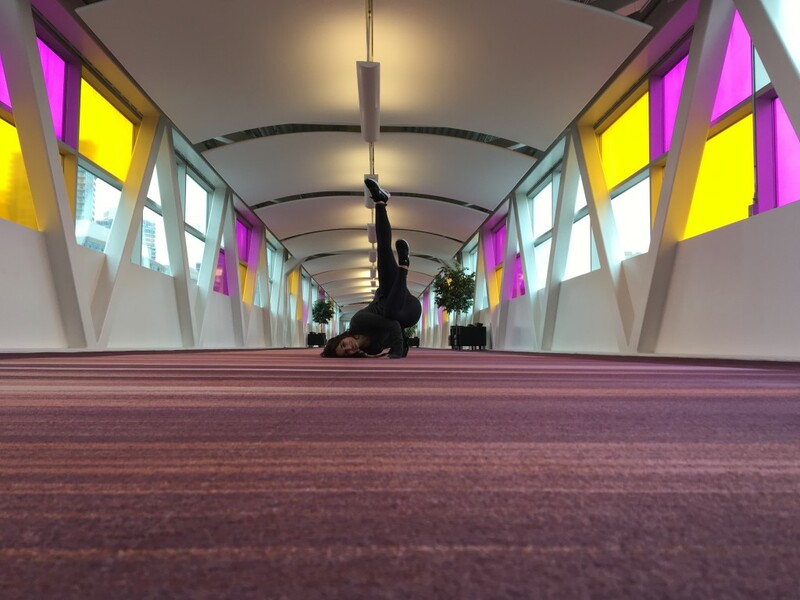 I am SO happy to announce that I am now a Yogi Surprise Ambassador. I love their unique selection of quality items and coincidentally enough, a wonderful fact about me is when I first opened my Instagram account, they were one of the first accounts I followed. 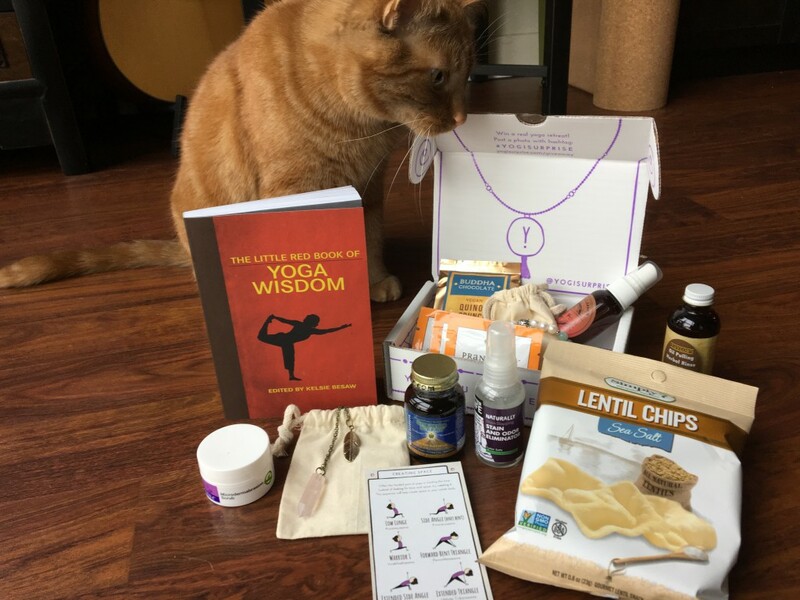 I was thrilled to receive my first box which was the March Yogi Surprise Lifestyle and jewelry box. Yeah, you heard that right, they have two options for boxes with amazing selections and surprises inside, but you should probably get both because it is so exciting and such a spirit lifter seeing that little purple Yogi Surprise Box in the mail from Portland. Actually let’s talk about the box. IT IS SO CUTE!!! *insert a billion emoticons here ;)* The design of the box is so simple and distinctive. The Jewelry box is slightly smaller and white instead of purple, you can see below how amazing the packaging is and also what i got in my March Yogi Surprise jewelry box. 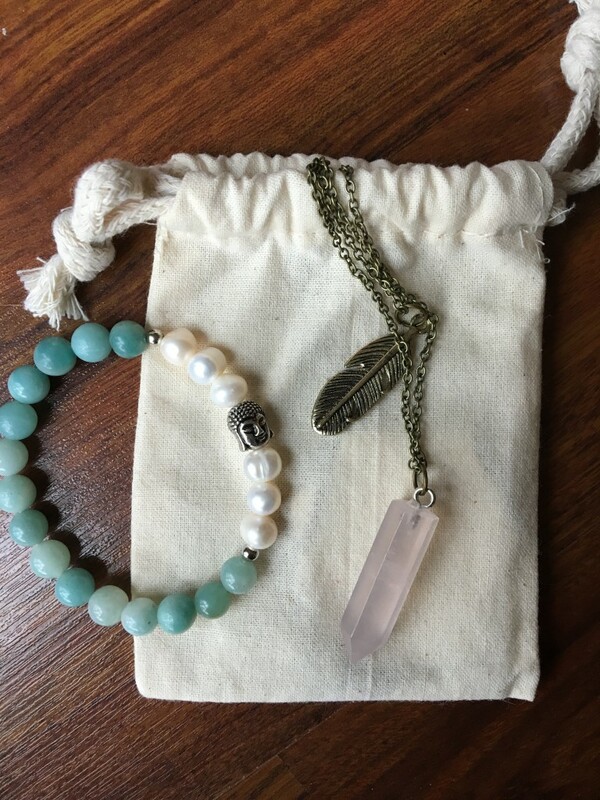 Tasty Buddha Vegan Quinoa Crunch Chocolate, Feather Rose Quartz Point Pendant Necklace & Pearl/Amazonite Buddha Bracelet. Side Crow transition into Fallen Angel with my Yogi Surprise Boxes! Opening these boxes was so much fun and the necklace and bracelet are GORGEOUS! 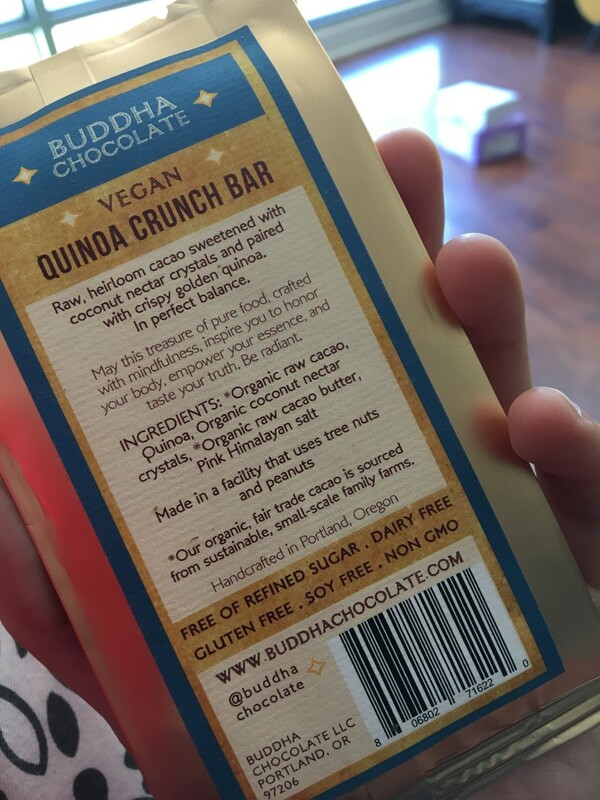 And that Buddha Qunioa Chocolate is SO good. 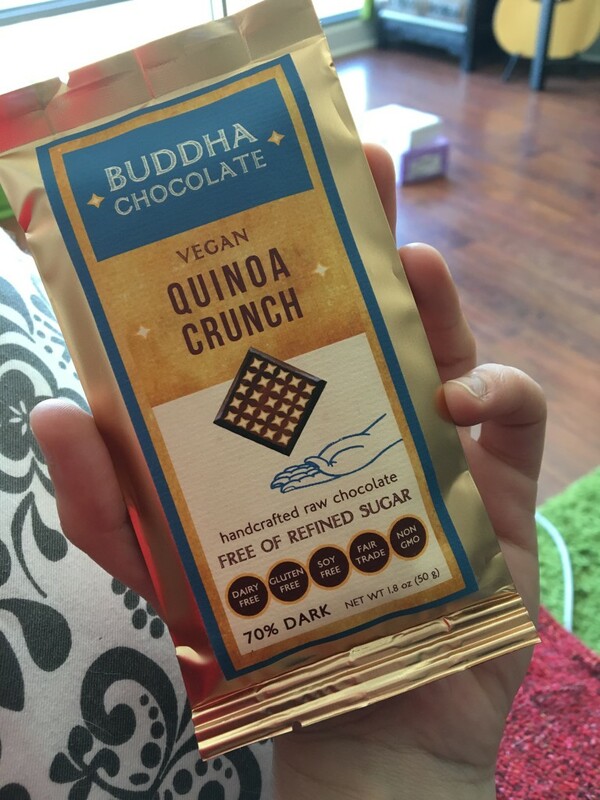 It is a darker chocolate taste with a light taste of quinoa, even though this thing looks like quinoa bark! So Yummy! Next up was the lifestyle box. It was like opening my birthday presents in March: filled with an array of healthy treats, skin care items, and a wonderful book. My partner was so excited to see the wonderful items we got this month too, so I’m positive this is going to be a real treat for us every month! 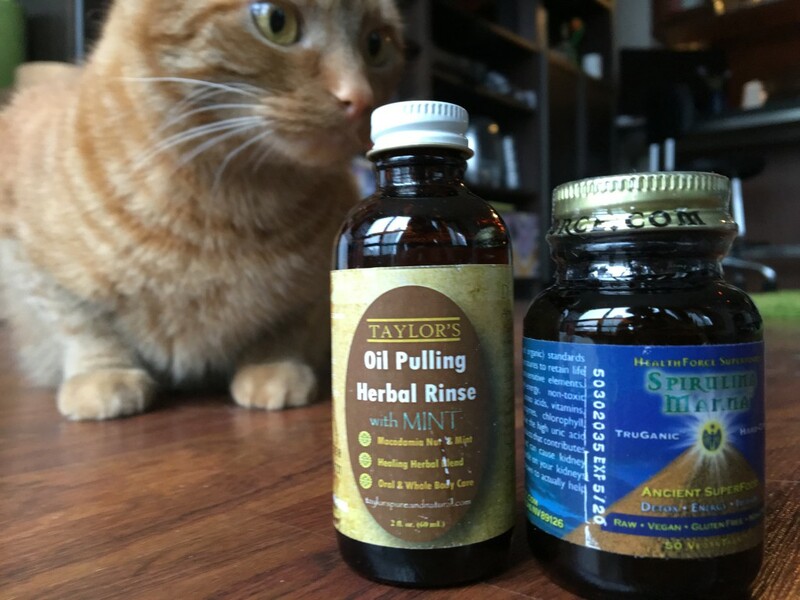 below is the Lifestyle box, and as you can see there is someone else who is also super excited about Yogi Surprise! My lovely Yogi kitty, ARLO! He seriously senses when I want to do yoga and immediately joins me, so of course he would love this box too. How amazing is that Flow card at the front of the photo above. I always get a little lost i flow so it was so nice to see that, I can’t wait for next months flow sequence! The lentil Chips were soo delicious. 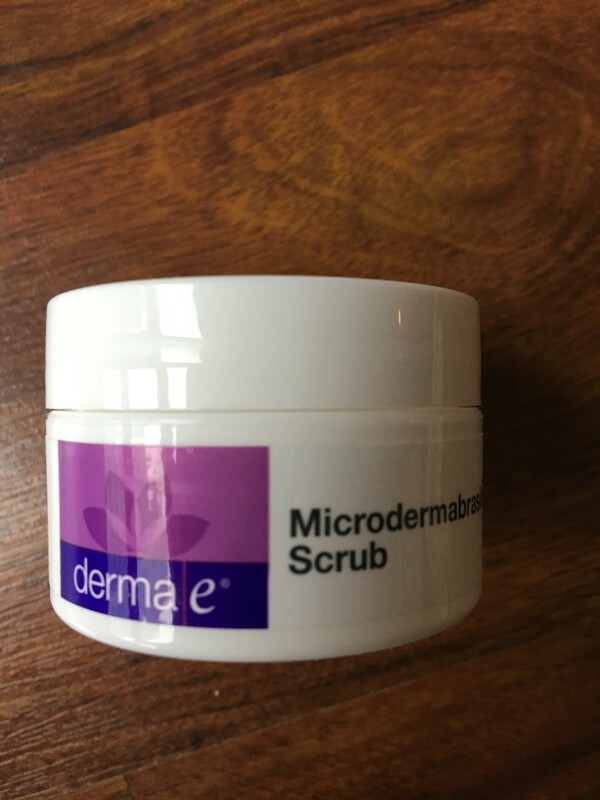 They taste like puffs of pure joy, and the micro dermabrasion cleanser by derma-E. Also this Book called the Little Red Book of Yoga Wisdom is so beautiful! As a newbie to yoga I don’t have any books yet so it was such a joy receiving my first! 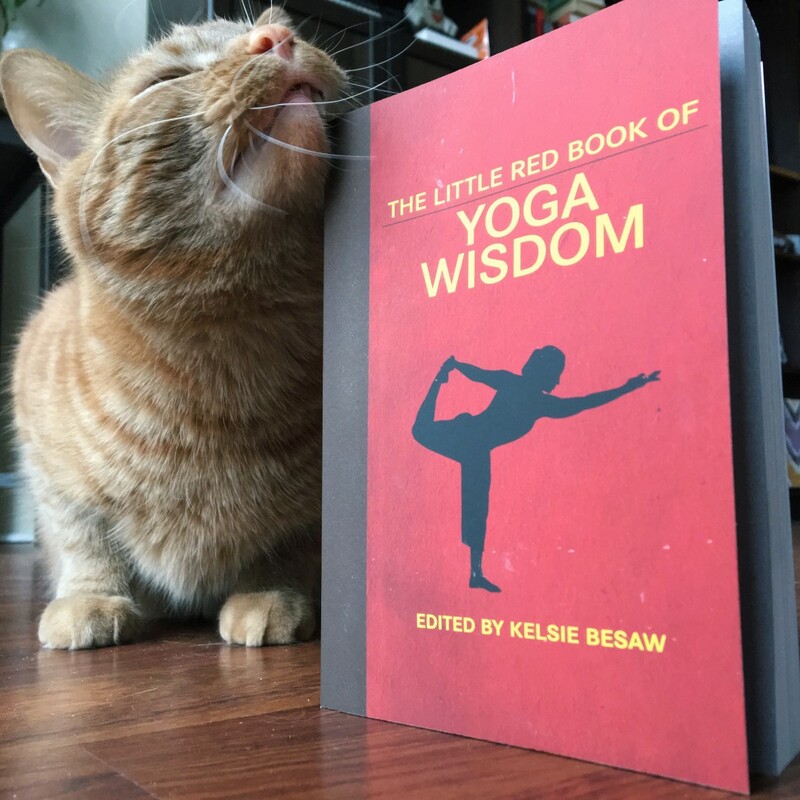 So far it is filled with words of wisdom, yoga poses, tips, facts, history and EVERYTHING I COULD DREAM of knowing in a little red book. It is a very light read and not at all heavy, just enough for a beginner or bedtime read, or to read a motivating quote before your practice and meditation. 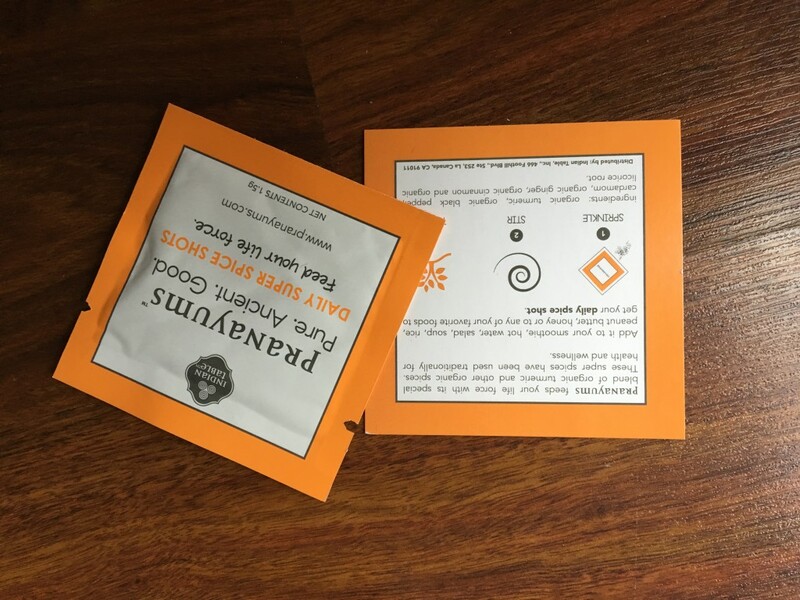 Also included was a pack of Pranayums – a special blend of turmeric, black pepper, cardamom, ginger, cinnamon, licorice root and other spices. 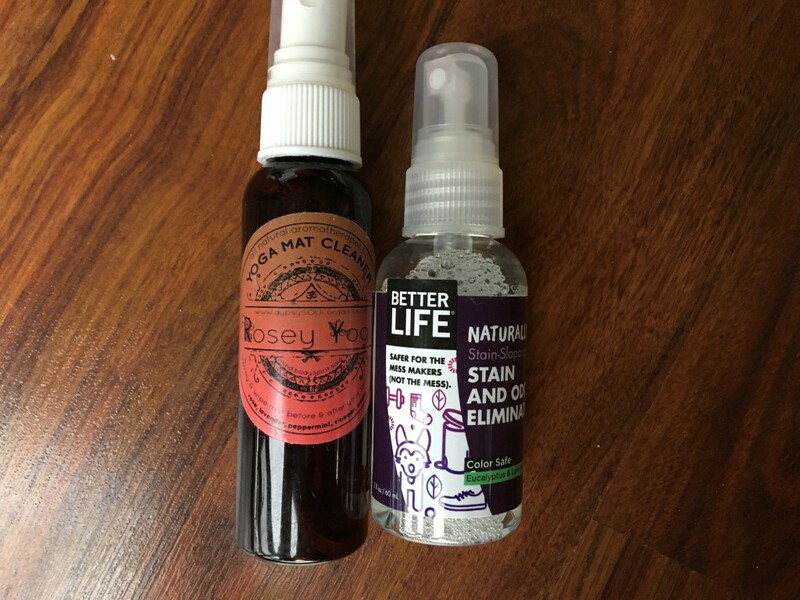 A Yoga Mat Cleaner from Rosey and a Stain a Oder removing spray for yoga bags and shoes! I had such an awesome time opening and using all of these products. My friend were excited to see some of them too! 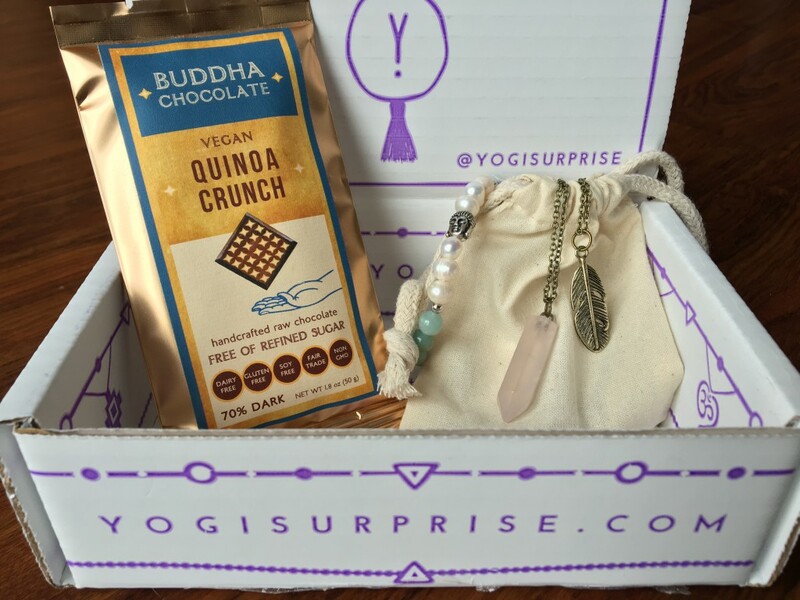 Check out Yogi Surprise and sign up for a box! I swear, you won’t regret it. 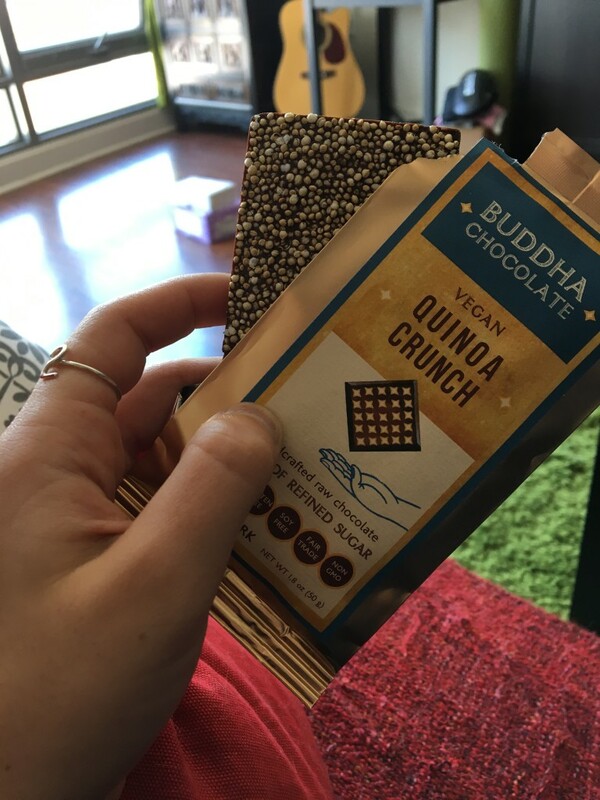 you can even use the code YOGILOVE for a generous 15% off any box!!!! https://www.asanavanessa.com/wp-content/uploads/2016/04/IMG_2123.jpg 2880 3095 vanessa https://www.asanavanessa.com/wp-content/uploads/2016/11/asanavanessa-logo-white-blackbead.svg vanessa2016-04-11 22:39:292016-04-11 23:01:04March Yogi Surprise Box! 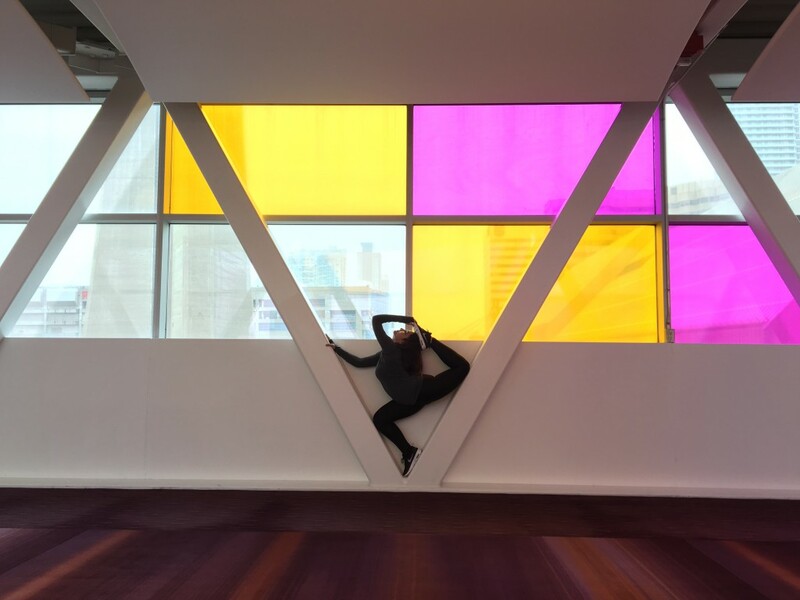 I had the pleasure of attending the Toronto Yoga Conference this past weekend and for my first time ever, it was amazing. I must admit, it was a bit overwhelming seeing all the brands and goods there but the amazing part is a lot of the exhibitors have samples and you can try before you make a purchase. Of course everything was so good, it was a bit hard to control myself when it came to buying everything! 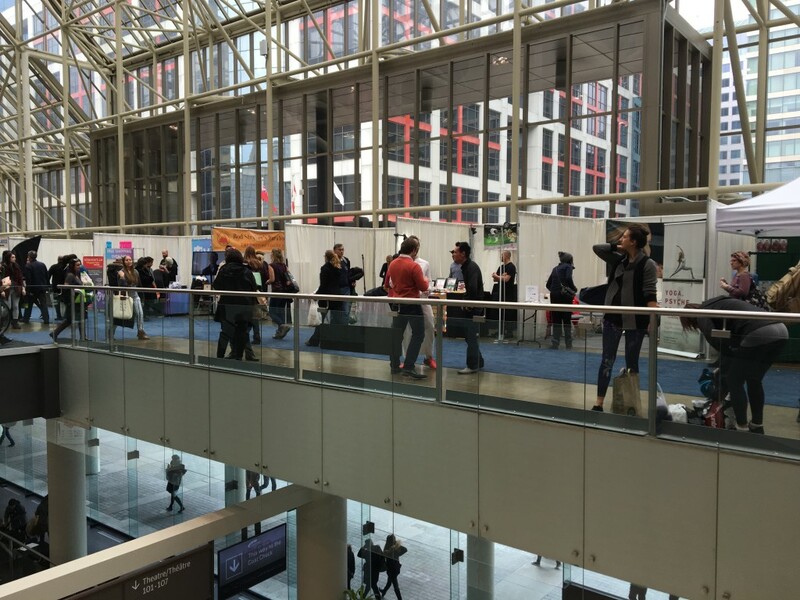 There were so many things to sample and see, many yoga mat brands including Manduka, Jade and BYoga Mat! They have an amazing program at the show where you can bring in an old mat to get $10 off any new mat in the show! Below is some of my haul from the show. My boyfriend loves these coconut chips from Grace, we even went back on Sunday and bought more. 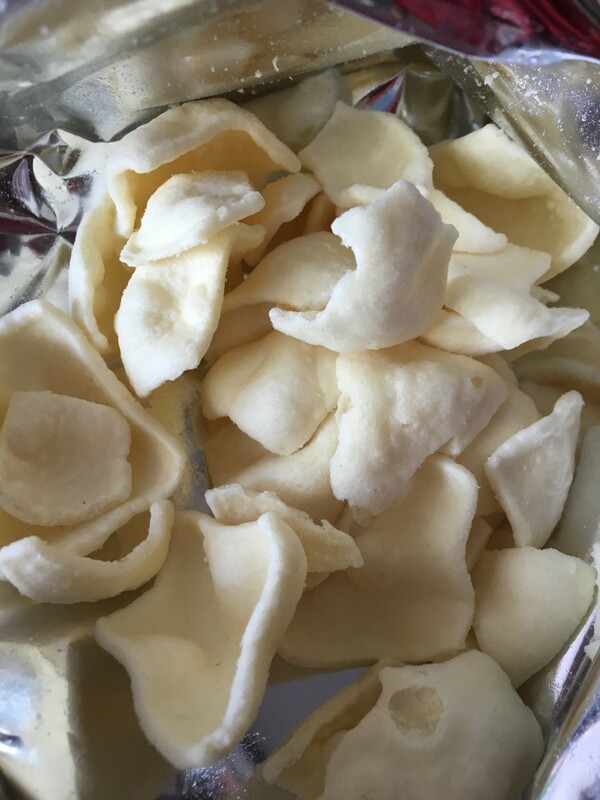 They are really interesting and tasty, they have the exact consistency of a chip but once its crushed down and a bit wet in your mouth, you can really taste and feel the coconut-y texture! We also sampled so many juices from the show but settled on this delicious and zesty raw organic juice from Revitasize. I can’t remember what all the ingredients in this drink are, but I believe it has spirulina and grapefruit in it. 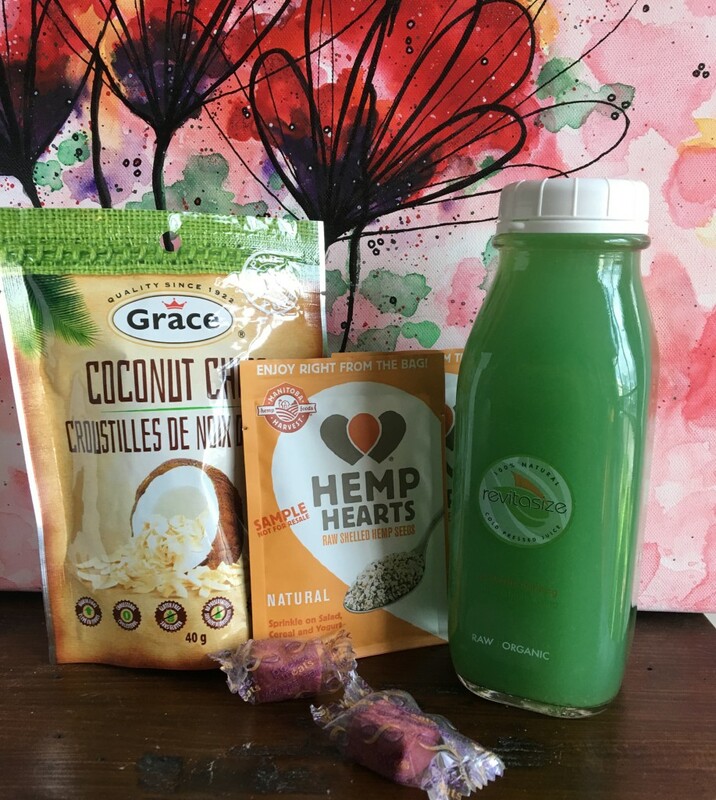 The rest are free goodies like tasty hemp hearts and fruit chewys. 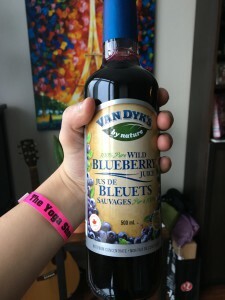 We also went back on Sunday again to buy the tastiest blueberry juice from Van Dyke’s. 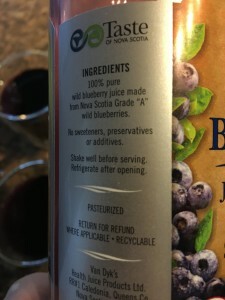 This juice is made from wild blueberries in Nova Scotia and it was so rich and full in flavour. We drank a whole bottle the first day! It is also advised to use this instead of orange juice for your mimosa in the morning hehehe. This was the most delicious juice ever! Pure wild blueberries from Nova Scotia! 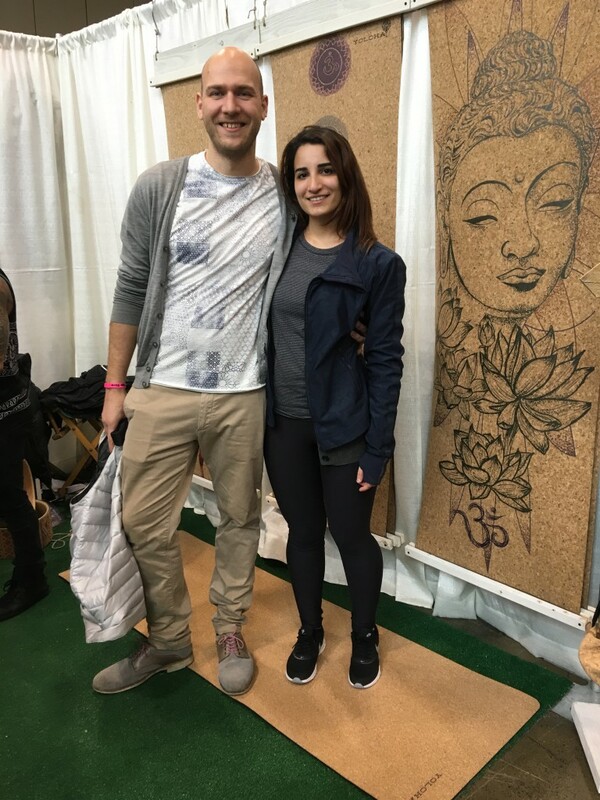 I had the pleasure of meeting Chris from Yoloha Yoga as well. This booth was one of my favourites for its eco friendly vibe. 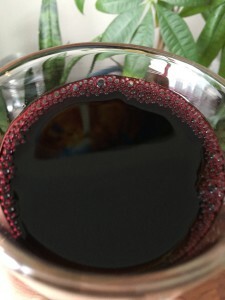 Everything is made from cork! They have water bottles, yoga blocks, yoga wheels, paddle board liners, yoga towels and more, all made form cork!! They also have such cute designs printed on to the products for a little artistic touch. 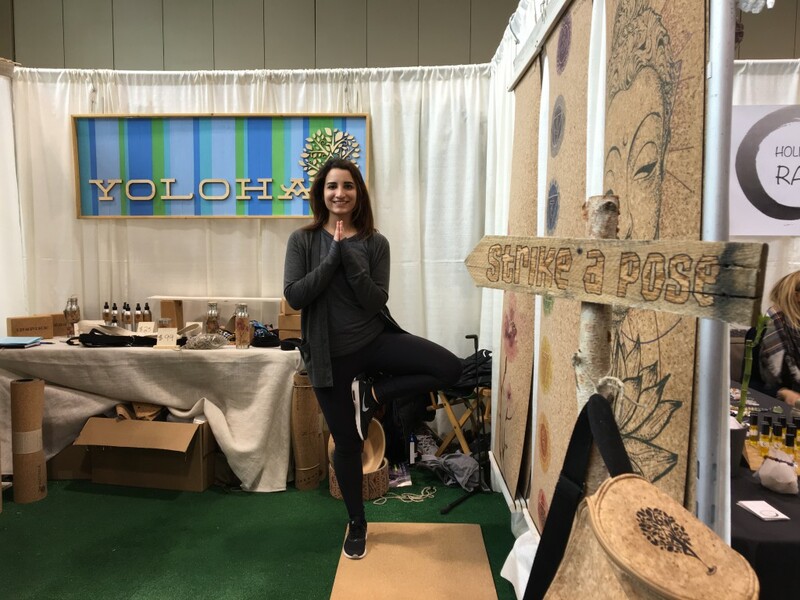 Tree pose at Yoloha Yoga booth! The Yoloha booth was fun, and I finally got to touch and feel the amazing cork products they have. I even got to try a wheel for the first time ever! It was so incredible, I definitely need to buy a wheel at some point soon – I can see so many benefits to having one. This booth was so cool that it was pretty busy the whole time I was there, I would have stayed and busted more moves on the cork yoga mat and probably attempted a handstand with that beautiful wheel if it was emptier. I stumbled across a huge Karma sign set up at the Flow Active booth and ran over immediately . I finally got to see the whole collection in person and I must say I am SO proud to be a Karma Activist! The collection is gorgeous and the quality is amazing. This year they launched their new KarmaLuxe™ line! 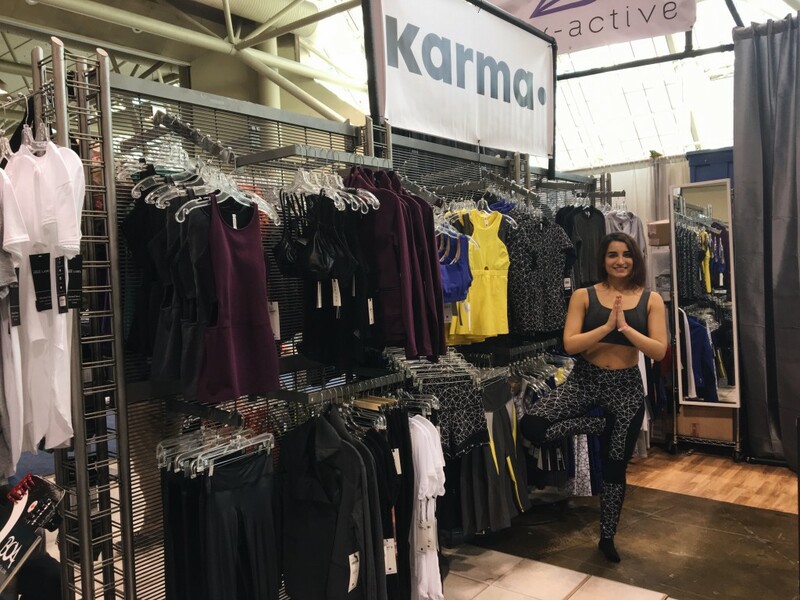 The latest signature innovation fabric, designed and engineered specially for Karma Athletics by a premium Italian Oeko-Tex® certified fabric mill. You can tell it looks different upon first inspection, it looks very neoprene and sturdy. Once I put those leggings on, I felt so ready to bust a move as it completely stretched around my body perfectly. I thought it looked thick but this fabric is so unique that it actually isn’t once it is on. I even had to get a size XS because the pants fit so beautifully and not thick at all! They are definitely compression pants, but I personally enjoy that in my workout leggings because it feels like ‘nothing will fall out’ haha! I typically buy workout wear for not only yoga, but also zumba and longboarding as well and these pants would work so well for everything. The Evelyn Bra was so snug and had such a cute design in the back! I need to write another blog post about Karma because there is too much to say about them! Printed Allyson tight in black glass shatter, size XS. And the Evelyn Bra in Charcoal, size S. Use the coupon code AsanaVanessana10 for and amazing 10% discount with Karma! They also had so many other amazing new prints and designs for bras and tops. This is one collection to check out! You can see it all at karmaathletics.com and use the discount code AsanaVanessana10 for an amazing 10% everything! 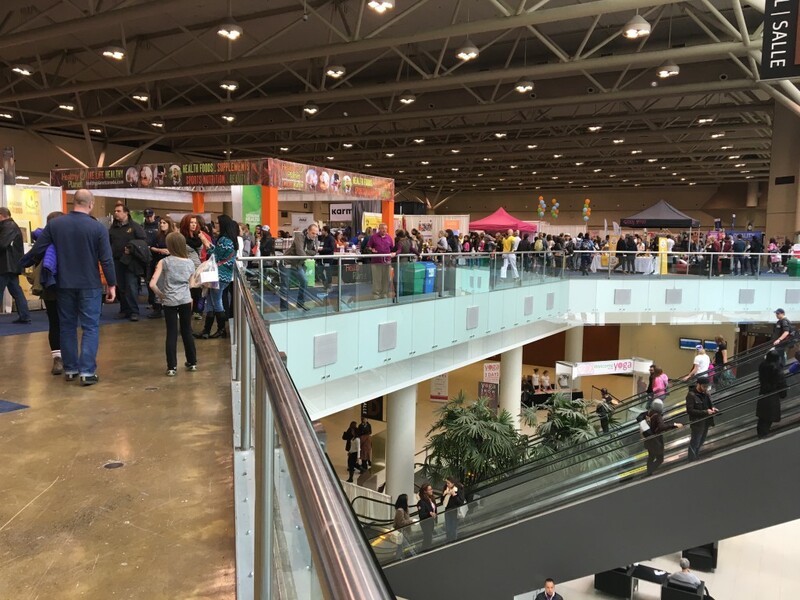 After almost exploding from all the healthy quinoa, granola, juice samples, we decided our time at the show was well spent and we should probably head home to sleep the excitement off (or eat more goodies). 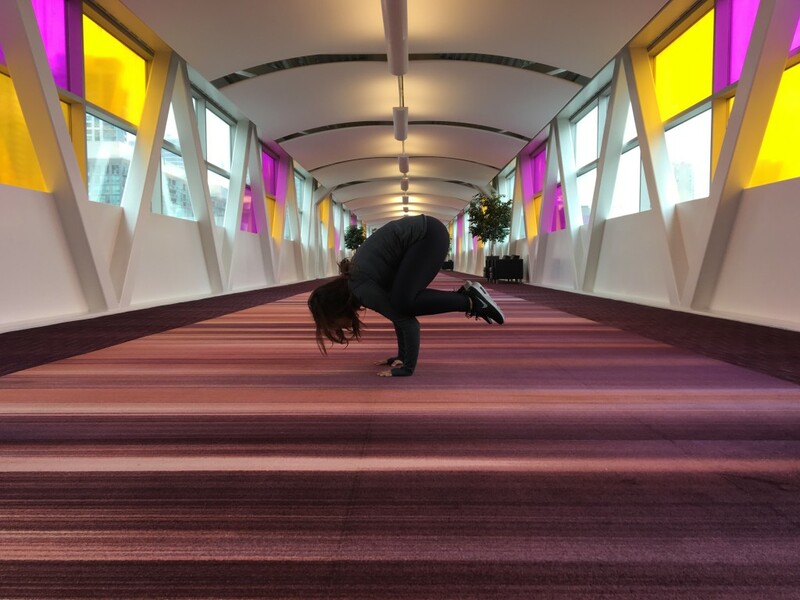 We decided to take the Toronto PATH, or try to at least, and found so many places to stop drop and yoga! How trippy are those carpets? 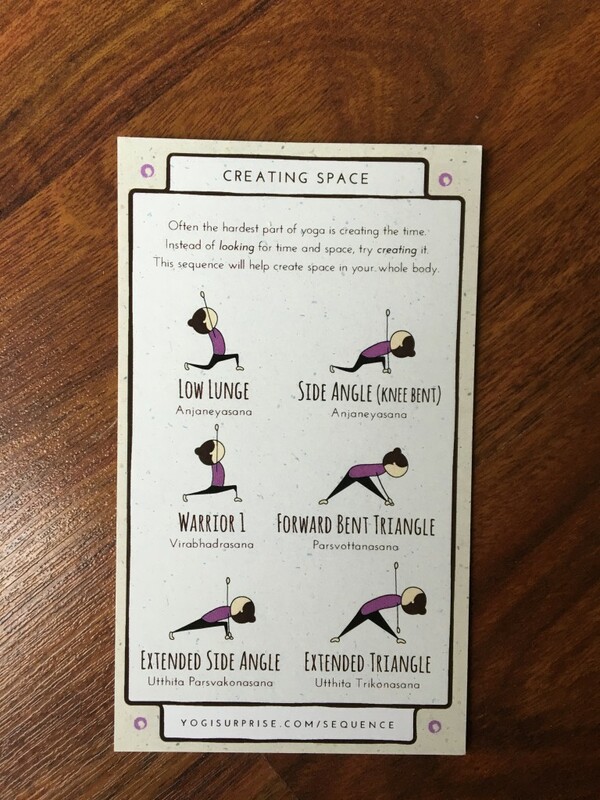 I need to go back and do some more yoga there, I was too pooped to do more than this! 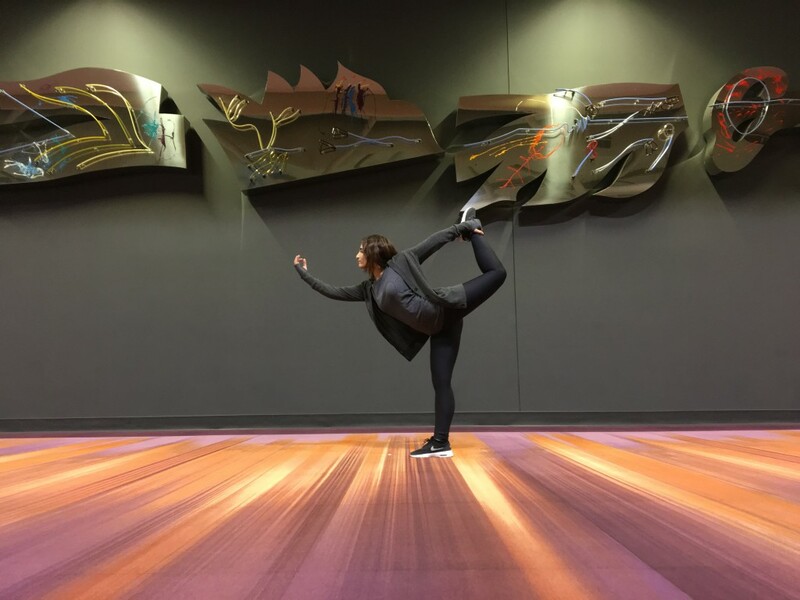 Can’t wait for the show next year, I had so much fun – thank you Toronto yoga Conference for having me! !